Recently I have become curious about trying new heath foods and drinks. So when I was asked if I would like to try Spirulina was eager to find out more. You may ask "What is Spirulina?" Spirulina was a traditional food of the Aztecs and the Kanem. Today, this microscopic equatorial algae is mostly used as a dietary supplement, but now Gourmet Spirulina has developed a range of great tasting convenient foods, offering consumers the opportunity to rediscover this nutrient rich superfood. 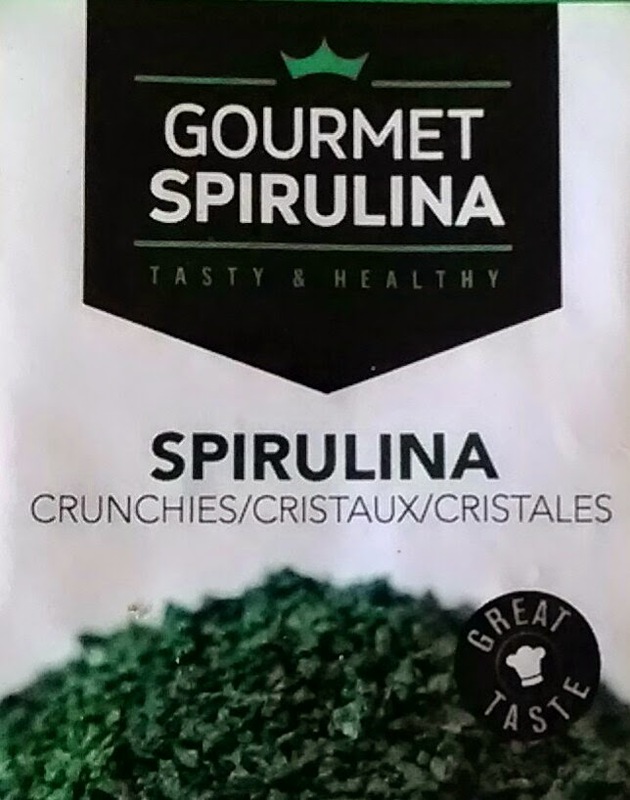 The Gourmet Spirulina range consists of tasty Crunchies, Nibs and Petals, which are equally rich in vitamins, iron and antioxidants, and vary in taste and texture depending on the drying process and the region they are grown. Spirulina Petals are a world first and are delicate in both taste and texture, making them ideal for discovering both the taste and nutritional benefits of raw spirulina. They are ideal sprinkled in desserts or eaten in a dried fruit mix, as a snack or by people on the go. Spirulina Nibs are the mildest spirulina superfood, from Burkina Faso, and the first of their kind in the UK and Europe. With a nutty-taste, they are ideal for people new to the taste of raw spirulina, and can be sprinkled into virtually any dish. Spirulina Crunchies are crisp and tasty, packed with chlorophyll and are fair traded from Costa Rica. Their crispy texture makes them an ideal snack with fruit juice – making them popular with athletes, people with busy lifestyles and people on the go. They are also ideal for adding to everyday dishes, or can be added to a nutritious smoothie. Again, they are unique to the UK and Europe. Gourmet Spirulina has a high phycocyanin rate of between 18% and 25%* – the best on the market; an antioxidant used as an indicator of the quality of the drying process, as well as one of the key components of its health benefits. Gourmet Spirulina also contains vitamin K2 for the maintenance of bones, pro-vitamin A beta-carotene for normal function of the immune system and vitamin B12, which is suitable for vegetarians and vegans. It is one of the best sources of bio-available iron. UK women aged between 18 and 49 have a mean intake of around 60% RDI . Adding just one spoon of spirulina to a source of vitamin C (such as fruit juice) each day will help achieve the desired RDI**. I have created a delicious way to add Spirulina to your diet. 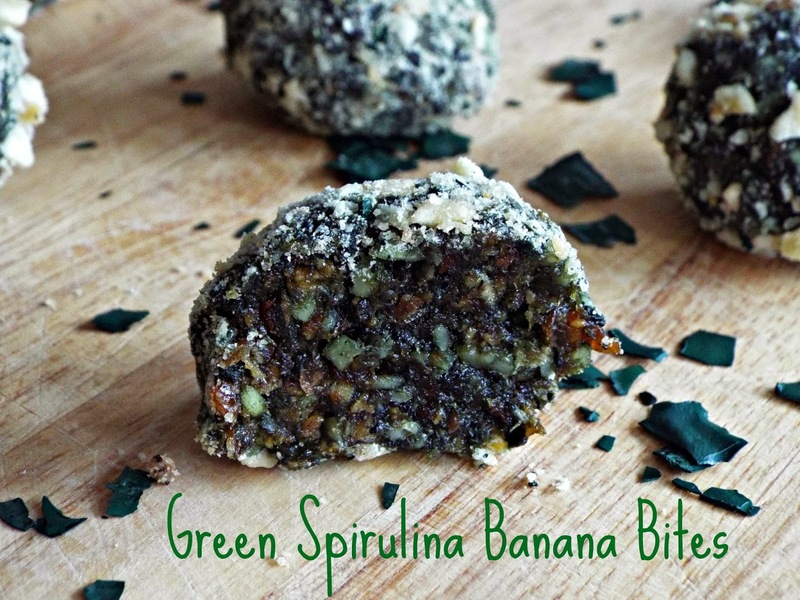 My Raw Green Spirulina Banana Bites are super quick and easy to make and full of all the health benefits of Spirulina. Disclosure: I was sent some Spirulina for the purpose of this post.